A streetcar waits at a railroad crossing. There is a wire mesh visible along the trolley wire at the crossing. This was to catch the trolley pole if it should come off the wire while the streetcar was crossing, thus preventing loss of power and a possible collision with a steam train. A man can be seen in silhouette in the control tower; he would have control of the crossing and perhaps the track switches along the steam railroad. 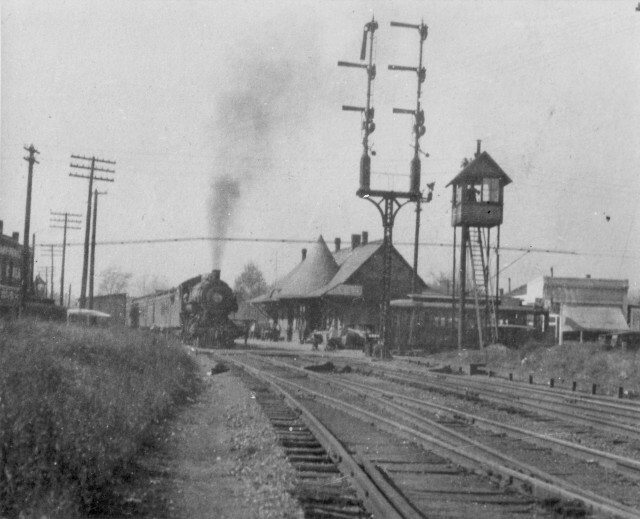 Note the complicated signal tower facing down the steam railroad tracks.